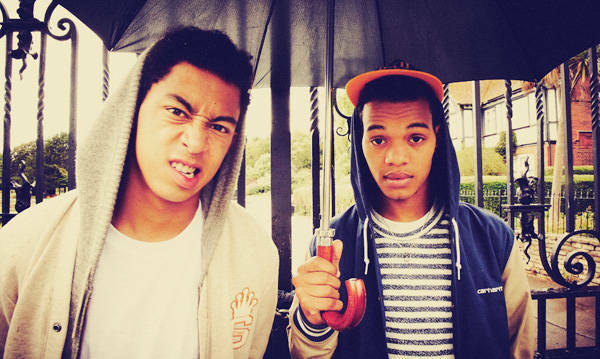 Rizzle Kicks have a whole host of showbiz pals and the boys have spoken out to EntertainmentWise about working with the legend that is Pharrell Williams recently, but when it comes down to the music mogul’s collaboration with Robin Thicke, the duo say that they would never do anything “so misogynistic.” Robin and Pharrell are surrounded by scantily clad females in the Blurred Lines video and despite joking that Thicke “took the song from them”, Rizzle Kicks‘ Jordan Stephens has said that he would “never make anything so misogynistic” when it comes down to musical collaborations. Speaking about working with Pharrell, the 21-year-old then added: “We made four tunes [with Pharrell] that were good, one in particular was good but it didn’t fit the vibe of the album.” He then continued: “We really wanna release it, we just hope Pharrell still likes us next year!” And with Pharrell having so much experience in the showbiz industry, did he give the Rizzle Kicks boys any words of wisdom? Harley Alexander-Sule tells us: “There was one time when he really pushed me to write something really cool, how I was really feeling and it worked.” Check out the Video Interview HERE.